New from HCP Formulas, Fibrenza is a blend of fourteen unique systemic enzymes that have been specifically formulated to dissolve fibrin, cleanse the blood, maintain a healthy inflammatory response, and to detoxify the body. Comprised of pharmaceutical grade enzymes, Fibrenza contains the most effective enzymes available today. Fibrenza contains one of the most expensive and effective enzyme ingredients available. 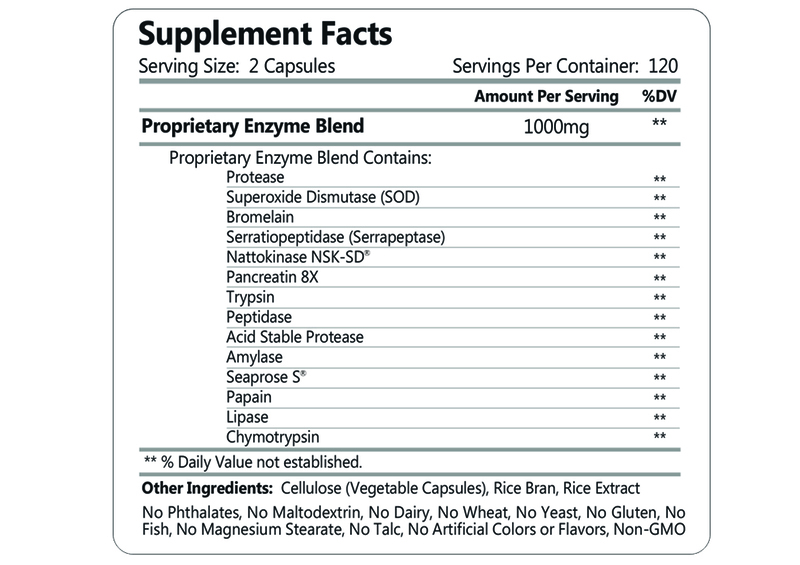 Seaprose-S is a protein-cleaving enzyme that is one of the strongest anti-inflammatory oral enzymes available today. Clinical Studies show it to be even more effective at fighting inflammation than serratiopeptidase. Visit our Express Naturals Blog to view the clinical study. Nattokinase NSK-SD is another proteolytic enzyme that is taken to maintain cardiovascular health due to its blood-cleansing and fibrin dissolving effects. Serrapeptase (Serratiopeptidase), Acid Stable Protease, Bromelain, Papain, Trypsin, Chymotrypsin, and Peptidase are more proteolytic enzymes that break down proteins and toxic debris. Many clinical and laboratory studies have demonstrated these enzymes to have significant anti-inflammatory properties. They are also recommended to limit the debilitating effects of excess fibrin. Superoxide Dismutase, also known as SOD, is an enzyme that break down potentially harmful oxygen molecules in cells, which may prevent damage to tissues. As a potent antioxidant, it is the foundation of anti-aging and detoxification protocols and is commonly recommended by healthcare providers for its anti-inflammatory properties. Pancreatin, amylase, and lipase are enzymes that digest protein, carbohydrates, and fat, respectively. When administered for systemic effect, these enzymes work to cleanse the body of toxic debris. Fibrenza has quickly become a main part of many healthcare professionals anti-aging protocols. Many users choose systemic enzymes as part of their life-long detoxification and anti-aging regimens. Fibrenza is unique among systemic enzymes in that it avoids unnecessary excipients, fillers, and binders. Users and healthcare professionals alike are more comfortable consuming a product long-term that doesn't contain these unnecessary fillers, plasticizers, or solvents. Fibrenza does not contain phthalates, maltodextrin, magnesium stearate, artificial colors, artificial flavors, talc, or titanium dioxide. Fibrenza is a non-GMO product. Fibrenza also avoids many ingredients that cause food intolerance or sensitivity. Fibrenza does not contain, fish, dairy, wheat, yeast, or gluten. Systemic enzymes must survive the harsh acidic environment of the stomach before reaching the small intestine, where they are absorbed into the bloodstream. In order to protect against these stomach acids, many systemic enzymes today consist of enteric coated capsules that contain phthalates (plasticizers), residual solvents, genetically modified vegetable coatings, or other unhealthy chemicals. Some are also available in tablet form, which in addition to containing unhealthy fillers and binders, may be more difficult to break down for timely absorption. Fibrenza utilizes a technologically advanced capsule to provide protection against stomach acids without the use of phthalates, plasticizers, or harmful chemicals and solvents. The AcidDefenz capsule consists of a plant-derived barrier that offers a timed release of the enzymes for absorption into the bloodstream. In addition to being a much healthier alternative to phthalates, it may also allow for more consistent enzyme absorption than traditional enteric coatings. Manufacturers Suggested Use: Take 2 capsules, twice daily. Your healthcare provider may also recommend an activation dosage of 4 capsules, twice daily for the first two weeks. Manufacturers Suggested Advanced Therapeutic Dosage:Take 4 capsules, twice daily. Your healthcare provider may recommend higher doses. None of the ingredients in Fibrenza are toxic. You may increase dosage as necessary. In significant dosages, some users may experience detoxification symptoms. Systemic enzymes are generally well tolerated, even when taken in extremely high doses. Some users may experience detoxification symptoms such as nausea, headache, fatigue or other flu-like symptoms. This detoxification is a healthy process for the body and is normally mild in nature. Symptoms may be reduced by increasing water consumption or temporarily reducing dosage. Express Naturals does not provide medical advice as we are not healthcare professionals. You may choose to speak with your health provider before taking any dietary supplement. These statements have not been evaluated by the Food and Drug Administration. These products are not intended to diagnose, treat, cure, or prevent any disease.